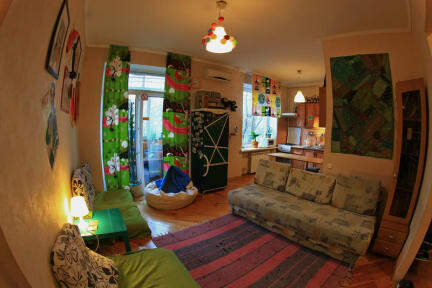 If you travel alone and you want to meet new people to have a good time in Kiev with, then this is the Place to go! It may not be to close to the metro however there’s a great Bar and a supermarket nearby. And the staff is just lovely and very helpful. I will stay here again! We stayed one night. Staff was 10/10.All we needed they helped with. Location is superB. Train station, metro or Kreshchatik you can walk to. Kitchen, shower and our beds were clean. That was what we needed from hostel. Thank you. It is a bit far from the center, but other then that it's great and the people there did a great job! Phenomenal hostel! Absolutely great staff, and the hostel seems to attract great travellers as well. The rooms and beds are comfortable and secure, and even the 10 bed room feels spacious. Lounge and kitchen space is super chill, with access to water and beer all the time :) Cannot recommend this place more! If I could change one thing, it would be the location, but it’s really not too far from anything, and the directions from the train station are spot on. Friendly and helpful staff and great atmosphere. Safest hostel I've ever been. 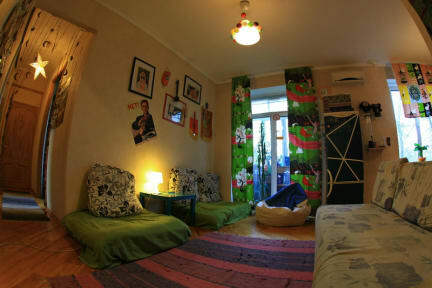 However the hostel it's a bit far from city center and metro station. The hostel is 20min away from the train station and its around 30 min walk to the city centre which was okay for us. They helped us organizing the trip to Tschernobyl and answered all the other questions we had. The rooms were clean and the common area was comfortable. But most important the crowd was fun even tough it was low season. Staff was a bit “annoyed” I felt.